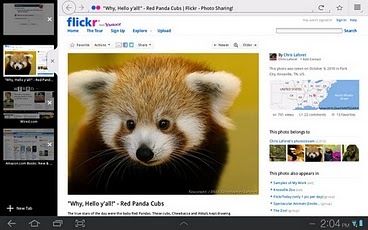 The most popular internet browser for PC, Mozilla Firefox has released Firefox 9 full For Android OS. It is much faster than it’s Beta version. It also offers the user a wide list of search engines to choice. However, it still lacks of various important options and features that should include in the upcoming versions. : Browse your favorite sites with minimal or no typing. : Access your browser history, bookmarks, passwords and open tabs from any device. Add-ons : Customize your browser quickly and easily. Speed : Get to the Web and find what you’re looking for fast. Tabs : Enjoy the convenience of tabbed browsing on the go. Personas : Dress up your browser the way you like it. Sharing : Use apps like Google, Twitter and Facebook to keep your friends in the loop. Location-Aware Browsing : Get better, more relevant information when on the go. Bookmarking : Swipe to the left and bookmark any site with one touch.